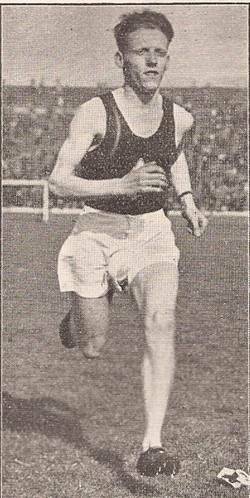 Tommy Tracey of Springburn is almost a forgotten man as far as the Scottish distance running fraternity is concerned and this profile is an attempt, however slight, to put it right. He is very highly spoken of by those who knew him, and the reports of his running and racing indicate that he was a quality athlete. His career was almost all within the period 1948 to 1957. 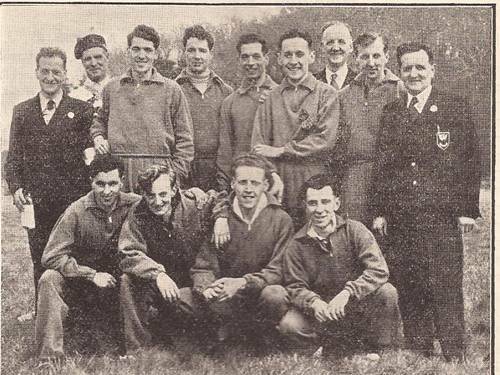 Season 1948-’49 and Tommy’s first run was in the McAndrew Relay at Scotstoun and although there was no outstanding time this time, John Emmet Farrell in the ‘Scots Athlete’ commented that ‘Tracey, who proved best of a well-balanced Springburn quartette, looks a good prospect.’ Two weeks later he was in the team for the Kingsway relay in Perth as part of a Springburn team that finished second with McLean, Reid and Jim Morton (who was fourth fastest on the day). In the Midlands Relays in December 1949 he was in the Springburn team which finished down the field: he himself had a good run though and was equal second fastest in the race. In the Midland Championship on 5th February 1949 he finished sixth. Then in March, he was nineteenth in his first National in a Springburn team which finished fifth and not far from the medals. There were two Edinburgh to Glasgow relays in 1949 and Springburn only participated in the earlier race, in April. Tommy made his maiden run in this event running on the second stage and pulling the club from seventh to fifth time on the leg. Emmet Farrell reported in September 1949 when reviewing the summer season that “The steady running of the Springburn Harriers in the Two Mile Races was a feature. Jim Morton and company certainly demonstrated that good team running can often defeat brilliant individualism and a weak tail. In the Three Miles Scottish Championship, Tom Tracey and Jim Morton ran above themselves to finish third and fifth and handsomely beat the standard time into the bargain.” So he was not just a winter season runner – the times for the event were not published in the magazine which only gave the winner’s time. “With Victoria Park’s Andrew Forbes still troubled with his leg and out for the season, Tom Tracey, 22 year old painter of Springburn Harriers has stepped right into his shoes as king-pin of Scottish distance men. Delighting his clubmates most with his recent National 3 Miles championship win, he has been unbeaten in Scotland so far this season over 2 and 3 Miles. His best 2 Mile time yet is 9:32.8 at Helenvale, and at Belfast he clocked the equivalent of a 14:37 3 Mile when finishing second to H Ashenfelter (USA) in a special handicap on a grass track. He started running at 14 and was sixth in a Scottish Youths Cross-Country Championship running for South Glasgow AAC, but gave up the sport for a couple of years with his club going defunct. Joining up with Springburn in 1947, he came under the eye of Jim Morton and nursed into the 2 Mile team the club were patiently building. Honours came over cross-country, winning his club championship in 1949 and 1950, and he gained his international jersey at Brussels by finishing third in the National. In the McAndrew on 7th October, Victoria Park won from Shettleston with Springburn third and there were two Springburn runners in the top six times but Tracey led them all with15:42 followed by Andy Forbes on 15:45, the second Springburn runner being McLean in fourth (equal to Ben Bickerton) with 16:08. On 21st October in the Dundee Kingsway Relay, Springburn were second to Victoria Park with Tom Tracey having second fastest time of the day with 13:47 to Andy Forbes’s 13:44. Revenge for the senior athlete! After praising Forbes’s return to form, Emmet Farrell said that Tracey is going great guns showing form equal to Forbes himself and is proving himself a grand leader of a splendid Springburn team. he ended by looking forward to the Forbes Tracey duels. In the District Relays on 4th October, Springburn were second to Victoria Park, and Tommy had fastest time ahead of Andy Forbes. The Edinburgh to Glasgow settled into the place that would become its own in November, 1950, and Tommy ran the sixth stage for the team that would finish fifth. Second fastest on the stage behind Andy Forbes, he picked up one place from sixth to fifth. The report in the ‘Scots Athlete’ refers to Springburn Harriers deserving sympathy for their plucky and courageous fight back after the mishap to their first and incidentally one of their best runners. It goes on to say, “Tom Tracey of Springburn excelled in the long 7 miles sector”. Looking ahead to the Beith Harriers New Year race, Farrell said The individual struggle may be the high-light with Forbes and Tracey setting a merry pace in front of the others. Both men have been within seconds of each other for fastest lap times this season with honours fairly even except in the ‘News of the World’ race where Forbes had the edge. This will, however, be the first time this season that they have met in actual scratch competition and fit and well they should provide an epic race with the winner anybody’s choice. For myself, I have a feeling that Forbes’ experience will still prevail against the Springburn crack’s youth.” The Beith race was not reported on but the Nigel Barge Five Miles Open Road Race on 6th January 1951 was and victory did indeed go to the older man with Forbes winning in 23:41 to Tracey’s 24:31 with Farrell himself in third in 24:48. The Midland Championships in February 1951 were held at Millerston with “under Arctic conditions with 7″ of snow lying” according to the ‘Scots Athlete’. It went on to report on the race, “The seven mile race served up some surprises when it was seen that Bannon and Tracey were alternately setting the pace and slowly dropping Forbes. Tracey ran out a worthy winner with Victoria Park taking the team award, coming away in the second half to wipe out Shettleston’s earlier points advantage.” Springburn was the third team with their counting runners being Tracey, John Stevenson seventh, Jim Morton eighth, J Wallace twenty sixth, N McGowan Twenty ninth and A Stevenson thirty seventh. Looking ahead to the National, Farrell thought it would be between Forbes and Reid before saying, “I cannot just see Tracey and Craig as serious challengers for the individual title yet I feel they are reasonably certain of forward places and international selection.” The story is told of Tommy, a month later, virtually missing the start the National of 1951 because he was on the wrong side of the fence talking to some club mates when the gun went off! He was not the only one to be caught out – the start was generally reckoned to be a wee bit early. Nevertheless, he made up enough ground to finish in second place behind Andrew Forbes who was also behind the line at the start. The photograph above gives the first six places. Tommy went home that day with two silver medals since the club had been second team. The ‘Running Commentary’ said: Despite a most indifferent start which caught Forbes, Tracey and others napping a most engrossing duel ensued between these two runners which ended in a narrow 20 yards victory for the former in a nip and tuck finish. These two were really out on their own. Andrew Forbes ran superbly and with magnificent judgment. Tom Tracey’s display was equally impressive and it is obvious that there is little to choose between these two grand athletes. When it is considered how much Tracey lost at the start and how near he was at the finish it looks only a question of time before he adds the cross-country to his three mile title.” The international in 1951 was a good one for Tommy Tracey. He was twenty fourth and the first Scot to finish, but the race was not without incident – “Tracey – Scotland’s Star. Despite the loss of a shoe, Tom Tracey ran a grand and gallant race to finish twenty fourth.” Shortly after the International, there was an invitation Festival of Britain 9 Miles Race in which Tom Tracey ran a sensationally brilliant race to take third place beating among others ‘laughing boy’ Saunders the International champion. Even though Saunders may be suffering from reaction after his brilliant Newport victory, nothing can gainsay Tracey’s great performance. Tom Tracey and Eddie Bannon have both put up performances worthy of great intrinsic merit and could prove a great Scottish spear-head for next year at Hamilton. Their deeds should also instil into Scottish runners a greater ‘conceit’ of themselves, should supply them with that confidence which has been lacking.” . The Forbes-Tracey duel carried on into the summer. The preview of the SAAA Championships contained this paragraph from Emmet Farrell: “Unless Anglo-Scot AT Ferguson enters, the Three Miles may develop into a tussle between present champion Tom Tracey and former champion and present record holder Andrew Forbes. The versatile Victoria Park man has up to the present revealed a slight edge over the Springburn man. But it should be a great battle between experience and youth. My preference is for Forbes who I believe has not entirely given up hope of Olympic selection next year. After Andy’s superb Three Mile win in 14:18 at the London Caledonia Games, he looked unbeatable but the Springburn star is ever-improving and has subsequently beaten Forbes over Two Miles in 9:25 and so this obviously looks the race of the day.” The race was at Hampden Park on 23rd June and the result was a win for Forbes. 1. A Forbes 14:28.8; 2. T Tracey 14:47.1; 3. I Binnie 15:05.0. The report read: “The Three Miles did not turn out to be the race it promised to be. Holder Tom Tracey who seemed off form a bit, could not match the pace of the machine-like Andrew Forbes who won it in the second fastest championship time of the series – and his own second best in Scotland with the time 14:P28. Andy complained of the track being slow and heavy.” The season’s rankings produced by the ‘Scots Athlete’ had Forbes first, Tracey second, Ferguson third, Binnie fourth and MacDonald (Maryhill) fifth. The actual best performances were first Forbes with 14:15, second Tracey with 14:45.5, third Binnie with 15:05.6. The McAndrew relay signalling the start of the cross-country season was on 6th October and the result was a win for Victoria Park with Springburn second. On the third leg Tracey lowered the course record by seven seconds – only to see Eddie Bannon take it even lower on the last leg by another four seconds to 15:20! In the Midland Championships of November 1951, Springburn struck gold and won from Shettleston by 20 seconds. The report in the ‘Scots Athlete’ read, Showing a return to form, Harry Fenion handed over a surprise lead for Bellahouston, with a five second advantage over Springburn’s John Stevenson and eight seconds ahead of holders – and favourites – Victoria Park (I Binnie). Running sweetly through, Tommy Lambert (14:36) took Springburn into the lead. Meanwhile Johnny Stirling (VP) was not his usual and dropped six places to ninth, and was passed by the club’s second string runner, R Kane who kept his team in fifth. At the end of the third lap, Springburn still held the lead through RF McLean but Victoria Park made ground through young Syd Ellis moving through from fifth to second, returning with 14:38, and Chic Forbes bringing the A Team to fifth with 14:32. With the last leg in the capable hands of Tom Tracey with easily the fastest time of 14:01. Springburn were proud and worthy winners with the total time of 58:27. Times and places: 1. Springburn Harriers 58:27, (J Stevenson 14:57, T Lambert 14:36 , RF McLean 14:53 , T Tracey 14:01); 2. Shettleston Harriers 58:47 (J McNeil 15:12, B Bickerton 15:08, RC Wallace 14:40, E Bannon 13:47. Fastest times: Bannon 13:47, Tracey 14:01. Then in the Edinburgh to Glasgow later in November, the team was third at the end of the first stage after a good run by John Stevenson and they were third at the end of the final stage after Tommy Lambert had a good run home. Tommy himself ran on the sixth stage again and was third fastest behind Bannon and Forbes. The team was Stevenson, McFadden, Morton, Wallace, Rankine, Tracey, McLean and Lambert. On 5th January 1952, Tom was third in the Nigel Barge (25:13) behind Forbes (24:48 and Binnie 24:58 and won the Inter-Counties contest at Westerton from Nelson and Gibson – all three from Lanarkshire. The Midland Championships were held in the extensive grounds of Woodilee Hospital in Lenzie on 2nd February, 1952. Bannon won again but Tommy was down in fifth position with the team third – they had three men in the top ten though – Tom was fifth, J Rankin was sixth and John Stevenson eighth with the their counters being Jim Morton, D Wallace and N McGowan. In his preview of the National Championships, Emmet Farrell said, “Coming to the individuals, Scotland’s big three are undoubtedly Eddie Bannon, Andy Forbes and Tom Tracey, and of these Bannon is the bright particular star and on present form must be a strong favourite to win our National cross-country title. Up to the present he has shown devastating speed and last year’s brilliant fourth in the English national demonstrated that he has the stamina to go with it. Andy Forbes, present National holder, despite some worry over foot trouble continues to reveal remarkable consistency of form and with his ability to rise to the occasion is a hard man to beat. Tom Tracey is also running well though perhaps not at the peak of his form.” In the National at Hamilton in March Tommy was third behind Eddie Bannon of Shettleston and AT Ferguson of Highgate Harriers in London but in front of Andy Forbes, Tom Stevenson (Greenock Wellpark) and Charlie Robertson of Dundee. He still qualified for the International Championship where he was twenty third and a scoring member of the team. In November 1953, Springburn were again out of the medals in the District relays, but that was not down to anything Tommy Tracey did or didn’t do! Fastest time of the day was by Eddie Bannon with 13:42, Tracey was second with 13:46 and Clark Wallace of Shettleston was third with 14:20. The Springburn team of McFadden, O’Reilly, A Stevenson and Tracey was seventh. In the E-G Springburn missed out on third placed medals by just four seconds to Edinburgh Southern Harriers. Tommy ran on the sixth again where he was third quickest behind Binnie and Bannon but picked the team up from ninth to fifth. S McFadden had the fastest time on the final stage but could not quite get to the Edinburgh runner. There were some new faces in the West District Championships at Lenzie in 1954 with the race being won by Harry Fenion of Bellahouston from John McLaren of Shotts with Tommy in third place leading the team to bronze medals. Emmet Farrell forecast the finishing order for the Nation thus: 1. E Bannon; 2. J Stevenson (Greenock); 3. R Reid (Birchfield); 4. T Tracey; 5. J McGhee (Shettleston); 6. H Fenion (Bellahouston; 7. WA Robertson (ESH). In the actual race, Tommy Tracey was second individual with the team in fourth position, only eleven points down on third placed Edinburgh Southern Harriers. After the E-G, then this – again losing out to ESH by the smallest of margins. How close was the individual race? 1. Eddie Bannon 50:19; 2. Tommy Tracey 50:42; 3. Harry Fenion (Bellahouston) 50:49; 4. R Kane (VP) 50:50; 5. F McKenzie (Shettleston) 50:51. His fourth and final run in the IAAF Championships was in 1954 and he was placed fifty first. 2nd October 1954 was the official start to the winter season because that was when the McAndrew Relays were held. Shettleston defeated home club Victoria Park as winners and had three teams in the first five. Springburn was third team and Tom Tracey was fifth fastest, behind Bannon, Andy Brown, Fenion and Russell. The 1954 Midlands Relays were held at Stepps Stadium again and the Springburn lost third place by six seconds to Shettleston B with Shettleston A and Victoria Park in the first two slots. Tommy Tracey ran the last lap in the fifth fastest time of the day (16:46) behind Bannon, Andy Brown, Harry Fenion, and Jim Russell. The exact same order as in the McAndrew. Tommy was again on the long sixth stage of the E-G in 1954 and again he was third fastest – this time behind Binnie and Joe McGhee. The team had been eighth at the end of the first leg but thanks to good runs by McLean, A Stevenson, O’Reilly and Futon, Tommy took over in third and handed over in third – from third to third in third fastest time – and the team was third in the race! In the Springburn team for the Midlands of 1955, Tommy Tracey was only second counter for the club: first scoring runner was Peter McParland who had had a glittering career as a Junior and on this occasion finished sixth with Tommy twenty first and the team again third. In his preview of the National, Emmet Farrell said: “Tracey, Fenion and Binnie: In normal circumstances, Tom Tracey, Harry Fenion and Ian Binnie might appear racing certainties and even now they could make up the first nine but leg injuries have severely limited the training of Tracey and Fenion and they may find their task of finishing in the first 8 or 9 by no means an easy one but they have class and the knowledge of past success to sustain them. Binnie on the other hand has rarely shown up well on cross-country but Hamilton race course should be made to measure for him.” But 1955 was the second time in three years that he missed the National at Hamilton and the team was fifth, probably regretting the absence of their top man. There were no appearances at all in the top rankings that summer for Tom Tracey. Tommy Tracey was in the Springburn Harriers C team for the McAndrew Relay on 1st October, 1955, but his time of 15:45 was faster than any of the runners in the A team and only fifteen seconds behind Gordon Nelson of Bellahouston who was fourth fastest. In the Lanarkshire Relays at Cambuslang he ran the first stage for the Springburn team that was third behind Shettleston A and B teams. In Stepps on 5th November 1955, the race for the Midland Relay Championship brought the club more medals. It was a much closer race than the previous year with Shettleston first in 56:16 and then Garscube 57:13, Springburn 57:29 and Bellahouston 57:42. Tommy was third fastest in 13:53 behind Bannon 13:46, Brown 13:51 and in front of Everett 13:57 and Nelson 13:58. In November, Tommy had the four thirds again! Still the man for the sixth stage he was third quickest behind Bannon and Binnie – and this time Tom Tracey was only one second slower than Binnie – he maintained third place and by the finish that’s where the club was. Despite this fine running, he was down to third club counter in the Midland District championship with another new face ahead of him: the first three scorers for the team were John McCormack in sixth, Peter McParland eleventh and Tommy Tracey in twentieth. The team was second with more new names – John McGale ( a friend of McCormack’s) twenty second, Eddie Sinclair thirty fifth and John Ballantyne forty fifth. March, 1956 was to be his last run in the National and it was his lowest finish of all – he was twenty seventh, eight places lower than his first run in the event. In the Midlands Relays in 1956, Tommy ran the last stage for his club team of O’Reilly (15:10), Rooney (14:28), McCormack (14:08), and himself (14:24). The team was fourth, missing medals by only fourteen seconds. He ran Stage Two of the Edinburgh to Glasgow in 1956 but was clearly injured or out of sorts because he dropped from the third place handed to him to thirteenth. The club was tenth. For Scottish endurance running, the period just after the War was a high spot. There were good committee men who had some drive – the Scottish Marathon Club is an example of that – and the standard of running, maybe in part caused by the level of fitness in the general population after the War, was very high. Victoria Park in the 50’s were Kings of the Road, Shettleston nearly Kings of Country, both being hotly pursued and not at all held in awe by Bellahouston Harriers, Springburn Harriers and many other clubs. For Tommy Tracey to maintain his position in open competition for as long as he did, is quite remarkable – look at the list of names he was competing against and then see his second and third places in the National for what they were. When I asked why the career was so short, the word was that his occupation as a painter did not help because of the constant exposure to paint fumes in sometimes very confined spaces and was possibly the cause of his lengthy absence in 1952-53. Whatever the reason, Scottish athletics was the poorer for the departure of Tom Tracey.